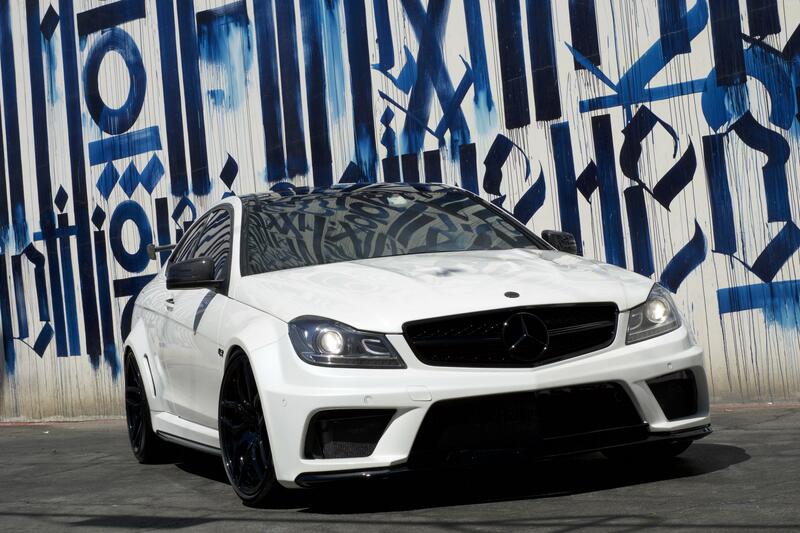 The Mercedes Benz C63 AMG is one of the most appreciated cars created by Mercedes Benz. It is a vehicle that is enjoyed by all car enthusiasts, whether old or young. The Mercedes Benz C63 AMG is a versatile sports car that can handle any condition thrown at it. Whether it be bringing out the beast to race other vehicles on a drag strip, driving through rough terrain to get to your favorite ski resort, or even just cruising through your city. When you combine the compact composure of the C63, the luxurious features that Mercedes benz is known for, and all the power stored under the hood, the Mercedes Benz C63 is a vehicle that you definitely can not go wrong with. The price of the Mercedes C63 is relatively low compared to other vehicles of its class. The engine, which is handmade in Affalterbach, Germany, is one that definitely can not be compared to the engine on any other vehicle. The balanced power inside the handmade engine put together with the drivetrain and transmission creates a vehicle that is so balanced, it can not be outdone. Whenever you decide to buy your Mercedes Benz C63, make sure to stop by Innovative Auto Craft in order to get some ideas on how to make your vehicle as one of a kind as possible. Although the Mercedes Benz C63 is a vehicle that is already unique when you pull it off the showroom, it may not perform to the full extent that you would want it to. Many vehicles are limited to the power they can bring out due to government regulations that are put on car manufacturers. Here at Innovative Auto Craft, we do our best to make sure vehicles perform to their maximum capability, and bring out the beast in the engine. Innovative Auto Craft offers the latest in performance products to take your vehicles to new heights. Whether it is brakes to stop better, suspension upgrades to corner better or the highly technical ECU tune to bring out the beast in your vehicle. This is exactly what we did to the Prior Design Wide Body C63 AMG, which is now an Innovative Auto Craft exclusive vehicle that we take pride in every day. From a regular Mercedes Benz C63 AMG, we turned this beautiful vehicle into one that is one of a kind all throughout the board. Innovative Auto Craft is a premier location for auto body repair, performance upgrades, and auto body customization. Besides bringing the beast in your vehicle out, Innovative Auto Craft can make it look exactly as you envisioned it. With hard work, expertise, and dedication, we created a regular C63 AMG into a vehicle that is as one of a kind as it gets. We present the Prior Design Wide Body C63 AMG, an Innovative Auto Craft exclusive that has been turning heads throughout LA. 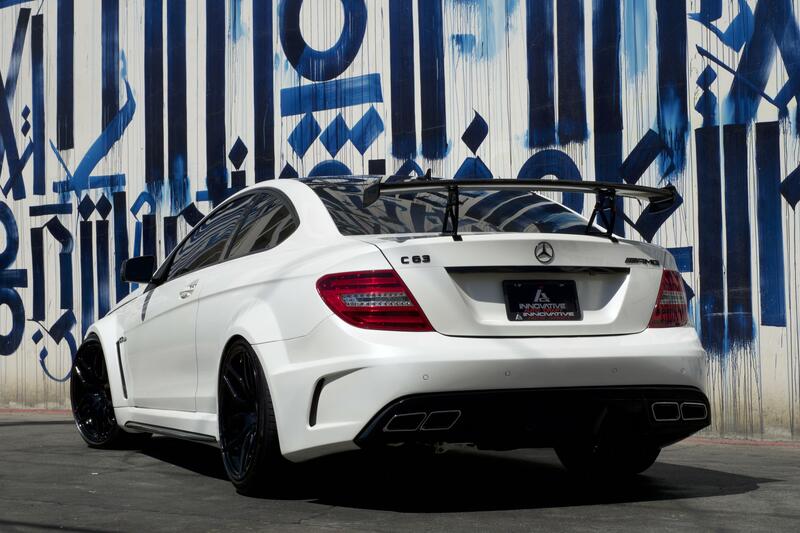 For this project, our goal was to hone in on the aggressive aesthetic of the C63. The centerpiece of the project is certainly the wide body kit from one of the most respected brands in the industry, Prior Design. The tailor-made Prior Design aerodynamic kit features the highest quality materials, exceptional design, and superb craftsmanship. Needless to say, the wide body gave the C63 AMG the forceful and refined appearance which we were looking to create. Next, we outfitted the C63 AMG with top-tier Rennen International forged wheels. The high-gloss black wheels add shine to the vehicle and complement the body color to create a sleek appearance. The final element we want to highlight is the AccuAir e-Level Air Suspension, the ultimate suspension control system. The e-Level allows the car’s height to be controlled and adjusted to road conditions. This premium suspension upgrade was the perfect way of wrapping the project up and turning this C63 AMG loose on the streets. 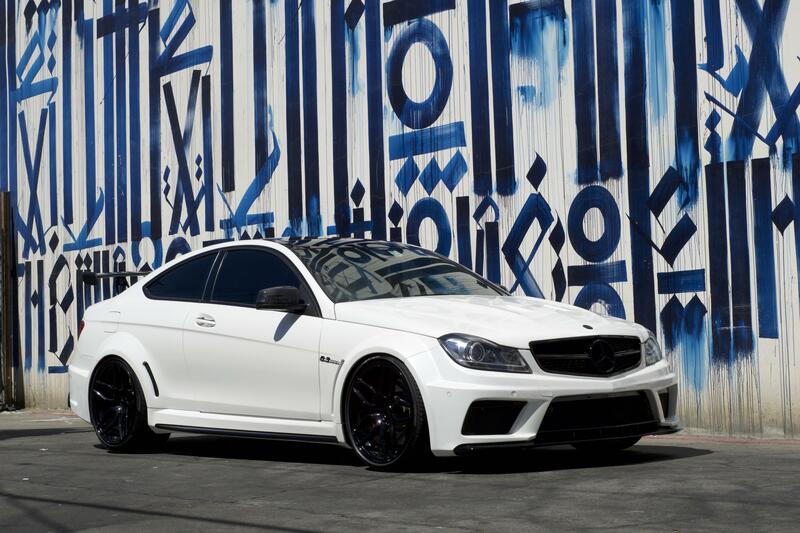 The beautiful black details on the white exterior of the Mercedes C63 make it as aesthetic as a vehicle can be. Although it may look like a beauty, it is actually as beast as they get. The coupe chassis of the Prior Design Wide Body C63 AMG gives it a more compostured look and feel, making it look more aggressive than other sedans. Innovative Auto Craft provides the latest in performance products to make sure your car feels the way you want it to. We did it to the Mercedes Benz C63 AMG, and we can do it to any vehicle. Innovative Auto Craft can provide customers with groundbreaking brake technology to make sure our customers feel safe when they have to press on those brakes. We provide suspension systems that can give your vehicle a unique and ferocious look while giving it the opportunity to turn corners without a breeze. If you want to bring out the inner beast in your vehicle and push it to its limits, we can install and service groundbreaking ECU technology to make sure you feel great while stepping on the throttle. Here at Innovative Auto Craft, we take pride in our work. We work on every vehicle in the same way that we would work on our own, and the proof is in the satisfaction of previous customers. For more information on auto body customizations, repairs, or performance upgrades, visit our website at www.InnovativeAutoCraft.com. Our website includes photos of vehicles we have customized in the past for customers. If our customer has a vision for their vehicle, Innovative Auto Craft will definitely turn that vision into a reality. If you have any further questions about the services provided by Innovative Car Craft, please call us at (323)-937-8177, email us at Info@InnovativeAutoCraft.com , or stop by at 7551 Beverly Blvd Los Angeles, CA 90036. Whatever your question or concern may be, Innovative Auto Craft will make sure to answer it to the best of our capabilities.